What is your Anki Vector MAC Address? How do you find it? Why does it matter? Find out here in Kinvert’s article on Vector’s MAC Address. Updated Jan 10th 2019 after changes to the firmware made by Anki. MAC address stands for Media Access Control Address. Each device will have a unique alpha numeric ID. These are used in networking so different devices can be identified. So, for example, if I always want to be able to reach my Linux server at 192.168.1.34, I tell my router the MAC address of the server and tell the router to reserve that IP address for only that MAC address. There will be multiple uses for Vector’s MAC address. We’ll talk about that toward the end of this article. If Anki makes an update after this article is published, keep in mind you might need to tap the button on Vector’s back more or fewer times to get the MAC address. If you leave Vector idle too long, the screen could stop showing the MAC address and you might have to repeat this process. There have been a few times I needed the MAC address for something. Most notably in college to use the Wifi, we’d have to give the tech department our MAC address so they’d know it was our device. 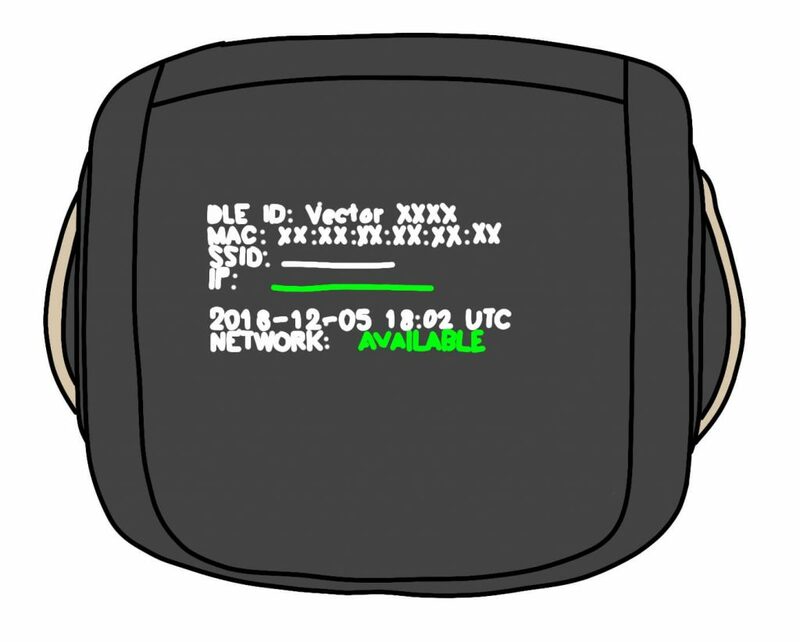 So a lot of people in colleges trying to register their device will need to know how to find Vector’s MAC address so they can tell the tech department. The MAC address is very useful if you’re trying to do things with Vector on a network. Kinvert writes a lot about Vector, as well as Cozmo. In addition, we write about STEM education in general. If you’re interested in Vector’s MAC address, there is a fairly high chance you’ll want to read about the Anki Vector SDK. This enables you to program Vector in Python. We have lots of Vector Examples showing you how to code him in Python and we’re always working on more. If Python isn’t your thing, or you’re new to coding and want to get started, check out our article on Block Coding. If you want to know some of the basics about robotics, you can check out What is Robotics? Finally, if you want to stay up to date with Cozmo and Vector, you should consider our mailing list. This article is currently the 4rth tip we send out to subscribers. You can unsubscribe at any time. When do you do these steps to find his MAC address. Is it like before set up or after the set up. Or do you do it a certain time during the set up like before connecting to the WiFi or as soon as you put him on the charger after taking him out of the box. Is the MAC address also in the About Vector in the app after you set him up? I’m considering buying a vector for Christmas but I live in a boarding school now where we need the MAC address to connect devices to the WiFi. That is a good question. We haven’t looked for the MAC address of a Vector that hasn’t been set up yet. Before you can set Vector up, I know you can reach that screen with Vector’s name on it by putting him on the charger and double clicking his back button. It stands to reason you should be able to do the other steps then and get the MAC address. I won’t be able to test this right away but will try to in the not too distant future. Keith thanks for letting me know about this through the mailing list. I think I will need his mac address next week. What is the next thing you’ll be sending? Sebastian unfortunately I’ve already installed my Vector as well. So I don’t have a way to test this. Does anyone have a new Vector and they can test if it works before you set up the app with him? If you got the email about Vector’s MAC address the next email you’ll get should be about What’s Inside Vector. I was just setting up my Vector, an as I have MAC filtering on my WiFi as well as a password. I couldn’t get Vector on it. Then I remembered the article you had sent me on your mailing list. While Vector was trying to connect to my WiFi I followed your instructions an got Vectors MAC address an put it on my accepted MAC list for the router. and he connected. This was after Vector was connected by Bluetooth, an I had to tell the program to try again, an it connected an is downloading updates as I type this. Thanks for confirming this worked Charlie! I’m excited to see what you do with Vector. Each time I try to find the mac address it only shows the first set of data. It doesn’t matter how few or how many times I click, what pattern, etc. I have one choice past the 4 digit key or he wakes up with the lift/lower. Any suggestions? By first set of data, do you mean the Vector-####? Or the screen that shows his IP Address?